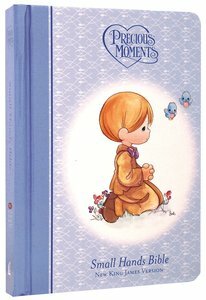 About "NKJV Precious Moments Holy Bible Blue (Red Letter Edition) (Small Hands Edition)"
This hardback Bible features the full NKJV text, with cute, full-colour illustrations from the Precious Moments range of books and gifts. Perfect for gift giving, this bestseller is a whimsical delight! Truly the best-selling children's Bible for little ones with over 14 million copies sold!